1. Play with color. Paint the walls your child’s favorite color (or colors) to add life to a room. Kids love bold colors, and letting them help with the decision allows their personalities to shine through. If you’re not thrilled with the idea of painting the whole room lime green or hot pink, go for a more neutral color for the base and use the bolder color as an accent. Go wild-try polka dots, stripes, camouflage or other artistic designs (remember you can always paint over it later if necessary). Check out an online color visualizer before you commit. 2. Add Wall Decorations. Adorn the walls with pictures of family and friends, posters of favorite movies or bands or removable wall decals of animals or video game graphics. 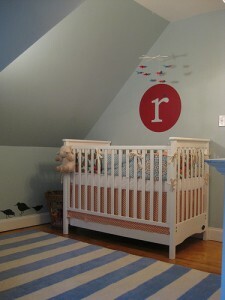 Hang personalized wall art or a growth chart to add décor with special significance. 3. Create an Art Gallery. Give your young artist a place to showcase his or her talents. Mount a large corkboard or a piece of galvanized metal as a magnet board. Use pushpins or magnets to display drawings, paintings and other creations. Paint a section of the wall with chalkboard paint so your child can create (temporary) art any time. 4. Make a Reading Corner. Section off a small part of the room that is dedicated just to reading. Place a few kid-height bookshelves near a good light and a few comfy chairs or beanbags, and it’s story time! 5. Get Organized. Make clean-up easy on you and your kids with built-in shelves and cabinets, underbed storage bins and hanging pockets. Find more simple and attractive organization ideas here.